SITING CONDITIONSWhere you position your building on site to best capture the views and sun may not be the most appropriate or safest location with respect to bushfire protection. The top of a hill may command the best views but it can also be the most hazardous location. Fire travels faster uphill and, generally, the steeper the site, the faster the fire will travel. Depending on the prevailing winds, orientation and the extent and proximity of fuel (trees and underbrush) surrounding the site, you may need to consider a number of locations and weigh up expansive views with hazard mitigation. Sitting on top of a hillWhile the house pictured here is located at the top of the hill, which would not be the preferred location in terms of mitigating bushfire, it is improved with the expansive clearing of vegetation around the house – its lawn reduces fuel and therefore the home’s exposure to fire.BENEFITS: Opportunity to see any encroaching fire on nearby ridges. CHALLENGES: Fire travels faster uphill, especially on steep slopes. Getting away from it allGetting sick of the hustle and bustle of the city, the traffic, the people, the general noise and congestion? Going to live in a beautiful house on a hill will certainly get you away from all that.But…Could you be too isolated? If you don’t have any friends in the area you’re dreaming of moving to, will you get lonely? What is the local community like? Will you be able to make friends easily or are you to happy to enjoy the isolation? An object in the landscapeSometimes the sloping land on which you wish to perch your home can act as a blank canvas. 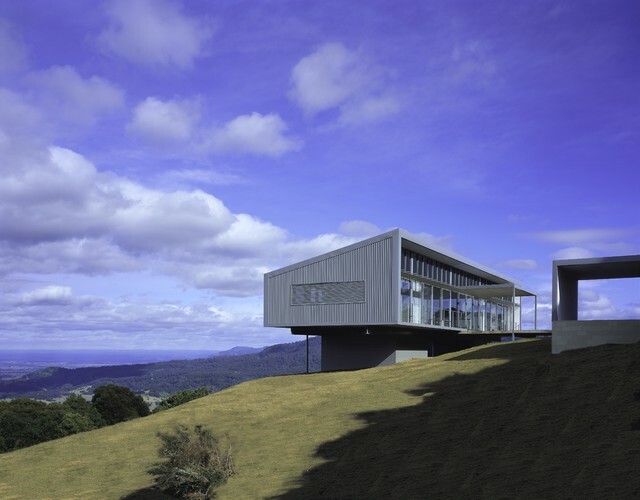 This home, designed by Ian Moore Architects, not only takes advantage of the view but has been designed as a standalone object to be admired from all angles. It’s as if it has landed on the grassy slope to survey the land ahead, and at any moment could disengage with the land and take off to another location.